The thought of making croissants sounded intimidating, but I wanted to try. Of course after several failed attempts (pictured below), I got them right. I certainly don't claim them to be a French quality croissant, but they are delicious. 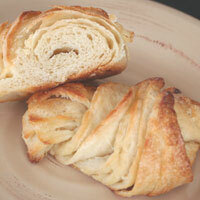 They are pillowy-soft and inside and crisp and flaky on the outside. 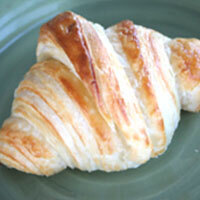 Before you begin, it's good to understand what a croissant is. Basically it's just layers of dough and butter. You will be making the dough and enclosing a block of butter inside, rolling it out, folding it, rolling it out, resting, etc. Until there are 36 very thin layers of butter and dough. Measure a bit more milk than you will use and heat in the microwave until boiling. Re-measure and let cool until warm/hot (105-110 degrees). Measure and stir the remaining dough ingredients. Add the milk and knead five minutes. The dough should be smooth, soft, and tacky (not sticky or dry). Some milk will be lost due to evaporation, so make sure you scald a little extra and measure it again afterwards. Shape into a ball and refrigerate covered in plastic wrap 90 minutes. 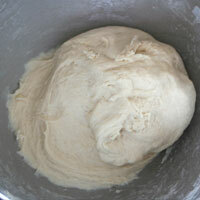 The dough after 90 minutes. Five to ten minutes before removing the dough from the refrigerator cut the butter roughly into tablespoon size. Beat in an electric mixer with the paddle attachment. Beat until the butter is completely pliable with no lumps. You will probably need to scrape the paddle and sides of the bowl to achieve this. Keep the butter as cold as possible. 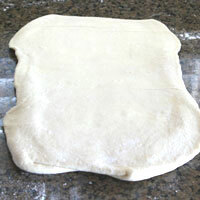 Remove the dough from the refrigerator and roll out into a 6 x 6 inch square. 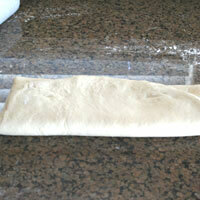 Place the butter in the center of the dough and form it into a 3 x 3 inch square. 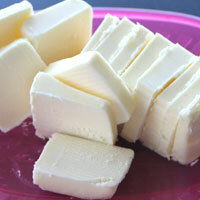 Fold the corners onto the center of the butter. 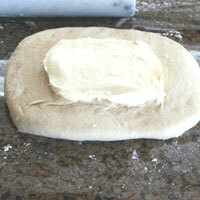 Try to make all of the sides of the dough touch the butter so the butter will distribute evenly. Pinch to seal the seams completely. 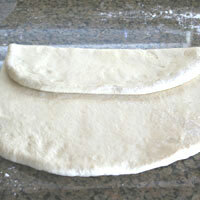 It is helpful to flip the dough over periodically while rolling out. This way you can check to see if any butter is leaking out, it also makes it easier to roll out and gives is a more consistent temperature. 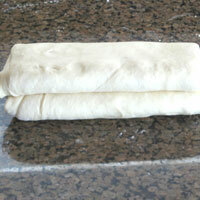 If the dough breaks a little and the butter is exposed, cover the break lightly with flour. Gently roll out into a 12 x 12 inch square. 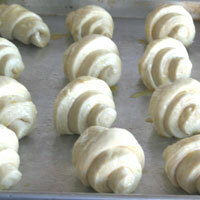 If the dough is handled roughly or rolled out too quickly the butter won’t distribute evenly. Fold the bottom third up and over the top third (like a letter). Turn it a quarter turn so the seams are on the top and bottom. Roll out into a 9 x 12 inch rectangle. Fold the top third into the middle and the bottom third into the middle. Close like you would a book. 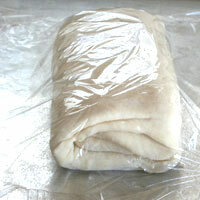 Cover in plastic wrap and refrigerate 1-2 hours. Remove from refrigerator and roll out into a 9 x 12 inch rectangle. Roll out one last time into a 30 x 10 inch rectangle. Cut into triangles 5 inches wide on top. Roll up and place on a lightly greased baking sheet. Cover completely in plastic wrap. Don’t wrap them too tight giving them room to rise. Refrigerate at least 2 hours and up to 24 hours. At this point look for the layers. 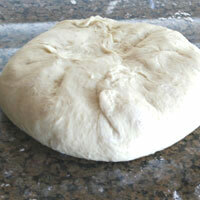 You should see very thin layers evenly throughout the dough. 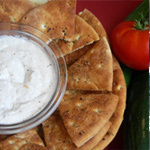 Remove from refrigerator 1-2 hours before baking. Let them proof covered at room temperature. Preheat the oven to 400 degrees 15-20 minutes before baking. Just before putting them in the oven beat the egg and water with a fork. Bake 18-22 minutes until a deep golden brown on top. Remove to a cooling rack to keep them crisp. Serve hot or at room temperature. Leftovers do not keep well overnight. 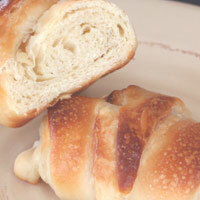 These turned out more like dinner rolls than croissants. They tasted good, but didn't have the delicate inside that a croissant should have. Chunky Butter: This is the biggest problem I encountered. If the butter is not completely pliable during the first few turns of the dough it will break and be in chunks throughout the dough. It is very important to get even layers of butter throughout the dough. You will be able to see the chunks if this is not happening. You will not be able to save the dough by this point, so I would recommend starting over and making sure the butter is completely pliable. If the baking sheet has a layer or butter on it when you remove the rolls from the oven the butter was not evenly distributed and leaked out onto the pan. These were better, but weren't flaky and looked odd because of the thick layers. 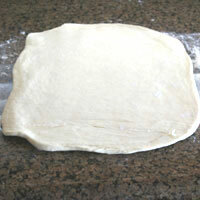 Thick layers: The final roll out of the dough should be ¼ inch or a bit less thick. 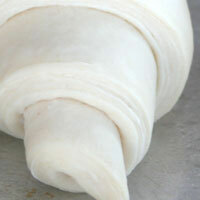 If the dough is thicker than this the layers will be too thick giving it more of a roll texture rather than a croissant. 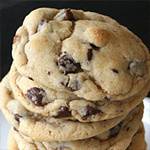 The picture here makes these look quite good, but the dough was handled too roughly. There were nice layers, but the bread between was a bit smashed. 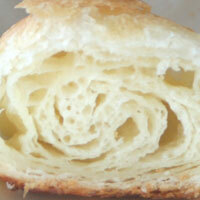 Smashed interior: The dough was rolled out or handled too roughly if the layers are too compact and not full of holes. 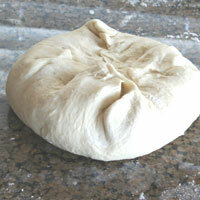 Give the dough time to rest if it resists rolling out. 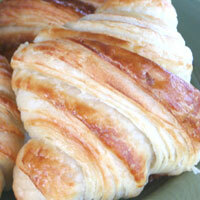 These were light, flaky, and delicious. 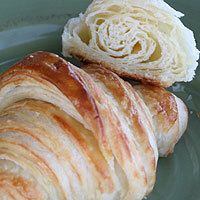 Thick rolls: Croissants are baked at a higher heat than normal rolls to make them flaky. Because of this the outside will brown faster. If the rolls are too thick in the middle they won’t have time to cook all the way through. Stick with the dimensions listed to bake them at 400 degrees. Egg Wash: The egg wash is necessary. I baked some without it and they looked dull and unappetizing. 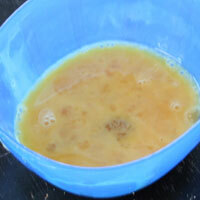 The egg wash gives it a shiny exterior and extra crispness. 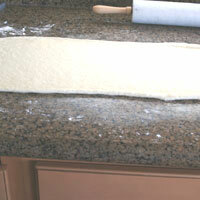 Light Rolling Pin: In my first few attempts I used a wooden rolling pin. I came across a heavy marble rolling pin at the store. I had heard it was good to use a heavy rolling pin. It was only $10, so I thought I'd give it a try. It made an amazing difference. The dough was able to stay colder because marble tends to be colder. Most importantly I didn't have to over-work the dough. With just a few rolls the dough was the proper thickness, whereas with the lighter pin, I had to apply a lot more pressure and roll it several more times. 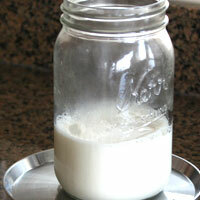 Measure a (1)bit more milk than you will use and heat in the microwave until boiling. Re-measure and let cool until warm/hot (105-110 degrees). Measure and stir the remaining dough ingredients. Add the milk and knead five minutes. The dough should be smooth, soft, and tacky (not sticky or dry). 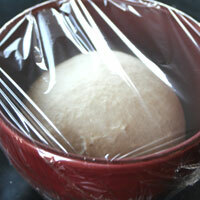 Shape into a ball and refrigerate covered in plastic wrap 90 minutes. 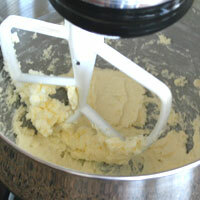 Five to ten minutes before removing the dough from the refrigerator cut the butter roughly into tablespoon size. Beat in an electric mixer with the paddle attachment. Beat until the butter is completely pliable with no lumps. You will probably need to scrape the paddle and sides of the bowl to achieve this. Keep the butter as cold as possible. 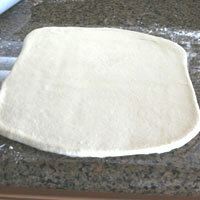 Remove the dough from the refrigerator and roll out into a 6 x 6 inch square. 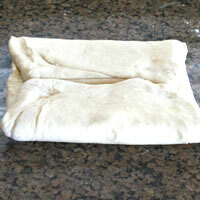 Place the butter in the center of the dough and form it into a 3 x 3 inch square. Fold the corners onto the center of the butter. 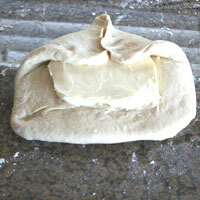 Try to make all of the sides of the dough touch the butter so the butter will distribute evenly. Pinch to seal the seams completely. Gently (2)roll out into a 12 x 12 inch square. 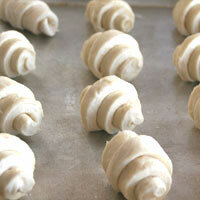 If the dough is handled roughly or rolled out too quickly the butter won’t distribute evenly. Fold the top third down and the bottom third up and over the top third (like a letter). Turn it a quarter turn so the seams are on the top and bottom. Roll out into a 9 x 12 inch rectangle. 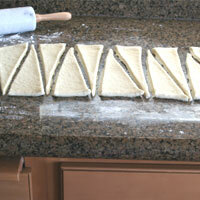 Fold the top third into the middle and the bottom third into the middle. Close like you would a book. 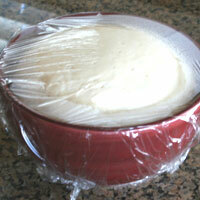 Cover in plastic wrap and refrigerate 1-2 hours. 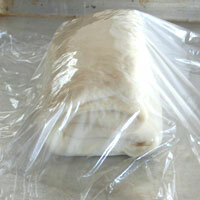 Remove from refrigerator and roll out into a 9 x 12 inch rectangle. Fold the top third down and the bottom third up. Roll out one last time into a 24 x 10 inch rectangle. Cut into triangles and roll up. 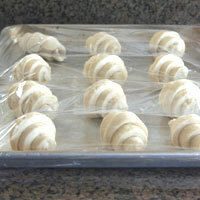 Place on a lightly greased baking sheet and cover completely in plastic wrap. Don’t wrap them too tight giving them room to rise. 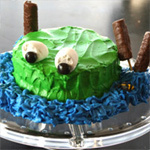 Refrigerate at least 2 hours and up to overnight. 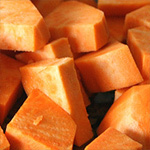 Remove from refrigerator 1-2 hours before baking. Let them proof at room temperature. Preheat the oven to 400 degrees 15-20 minutes before baking. Just before putting them in the oven beat the egg and water with a fork. 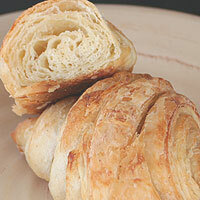 Brush each croissant with egg wash. Bake 18-22 minutes until a deep golden brown on top. Remove to a cooling rack to keep them crisp. Serve hot or at room temperature. Leftovers do not keep well overnight. 1. Some milk will be lost due to evaporation, so make sure you scald a little extra and measure it again afterwards. 2. 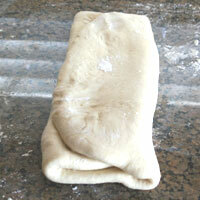 It is helpful to flip the dough over periodically while rolling out. This way you can check to see if any butter is leaking out, it also makes it easier to roll out and gives is a more consistent temperature. 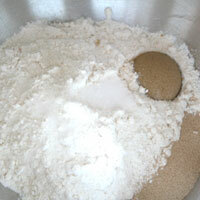 If the dough breaks a little and the butter is exposed, cover the break lightly with flour.